Hello! We are the Taiwanese-American Student Association from Rutgers University (RU TASA). As a student-run association that spreads awareness of Taiwanese culture at Rutgers, we have a big event called Night Market that emulates the popular night markets on the streets of Taiwan. This year will be our 14th annual Night Market! We also have performances throughout the night, fun games, and authentic Taiwanese deliciousness served fresh by local eateries. This year's Night Market starts at 6:00 p.m on April 14th at Morrell St., New Brunswick, NJ 08901 between the Rutgers Student Center and where Au Bon Pain used to be. The rain date will be April 16th. The theme for the Night Market will be Kawaii Avenue! This means that there will be cute cartoon characters scattered down the street. This event is not limited to Taiwanese people; everyone is welcome to experience Night Market and learn about Taiwanese culture and cuisine. It would mean very much to us if the students, parents, faculty, and administration of Union Chinese School could support us by attending our event and spreading the word. If you are interested or have any additional questions, please reply to this email and we will give you more details. My name is CeCe Cihang Gu and I am a researcher from Johns Hopkins School of Medicine in Baltimore, MD. We are currently conducting a research study among families in the Northeast regarding parenting and child eating behavior to investigate the environmental influences on childhood obesity, especially in Chinese Americans. The study is conducted through a survey and each parent who completes the survey will receive $5 in compensation. Enter to Win $100 in Johns Hopkins Child Eating Research Study! Help us study the effects of parenting on childhood obesity! Johns Hopkins School of Medicine is conducting a research study in children 5-12 years old and their adult parents to investigate the behavioral influences that affect child weight. This study involves the one-time, 20-30 minute completion of questionnaires regarding basic demographic information, parenting behaviors, and behaviors and attitudes towards food weight of you and your child. Upon the completion of the study, you will receive $5 in compensation as well as be entered for a chance to win a $100 gift card! The Union Chinese School is a non-profit organization that has educated and promoted the awareness of Chinese language and culture for 38 years. 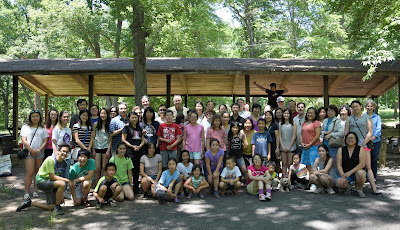 It celebrated the closing of 2015~2016 school year by holding its annual picnic event at Tamaques Park on 6/18 (picture was taken). 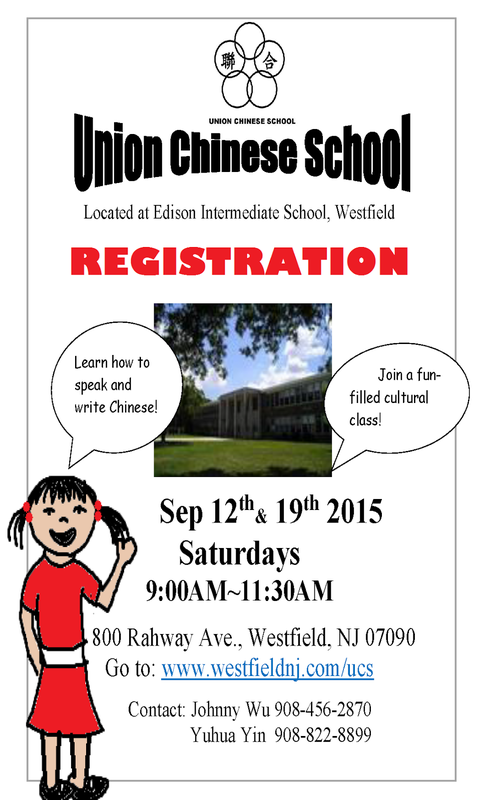 Registration for 2016~2017 school year for language and culture classes will take place on two Saturdays, September 10th and September 17th at Thomas Alva Edison Intermediate School, 800 Rahway Avenue, Westfield, NJ, 9:30-11:30 am. The Union Chinese School offers courses in Mandarin for students from preschool to high school, as well as traditional culture classes such as calligraphy and Chinese chess. Adult Mandarin class and Yoga class are also available. For further information about the school, please email UCS school principal, Airu Chen at ucsnjp@gmail.com. ABC Clarion's writing competition is designed for student writers to put their creativity and skill to the test. Describe a time when you experienced failure. How did the experience affect you? ● Essays must be non-fictional, including creative nonfiction, memoirs, etc. Vincent van Gogh once said, "The only time I feel alive is when I'm painting." Write a narrative about someone engaged in an activity that makes him/her feel alive. ● We will accept a 750-word excerpt—a chapter, for example—from a longer work of fiction as long as the excerpt relates to the prompt. ● Any form/style of poetry is allowed. Feel free to get as experimental as you like! Impress us! ● The competition is open to students currently enrolled in grades 8 through 12. Each student is allowed ONE ENTRY per category. To get more information/details about the guidelines, visit http://abcclarioncomp.weebly.com/ or http://abcclarion.jigsy.com/. Guitar fans who saw Beppe Gambetta back in January will certainly remember Shun Ng, who opened for him. He is an exciting and innovative young guitarist making a splash in the guitar world today. With great virtuosity on his radically designed guitar, he performs his own music as well as some unexpected covers of unlikely, and yet familiar songs. His style is part jazz, part blues, maybe even a little disco, and 100% joy. He is exciting to watch and brilliant to hear. Eclectic Consort opens. As chair of the New York/New Jersey Regional Network of the White House Initiative on Asian Americans and Pacific Islanders, I’m sharing this press release with you. Hello! We are the Taiwanese-American Student Association at Rutgers University (RU TASA). As a student-run, on-campus association that spreads awareness of Taiwanese culture at Rutgers, we have a big event called Night Market that emulates the popular night markets on the streets of Taiwan. We're going to have performances, games, and authentic Taiwanese cuisine served by local caterers. This year's Night Market starts at 6:00 p.m on April 8th at Morrell St., New Brunswick, NJ 08901 between the Rutgers Student Center and Au Bon Pain. This event is not limited to Taiwanese people; everyone is welcome to experience night market and learn about Taiwanese culture and cuisine. It would mean very much to the Taiwanese community at Rutgers if the students, parents, faculty, and administration of Union Chinese School could support us by attending our event and spreading the word. If you have any additional questions regarding Night Market, feel free to reply back to this email at rutgers.tasa@gmail.com. We hope to see you at our event! CACA-Union Chinese School (UCS), a not-for-profit organization dedicated to Chinese education, has been providing high quality Chinese language and cultural classes to the neighboring communities for more than 35 years. The new school year (2015-2016) registration will be held on Saturdays, September 12th and September 19th from 9:00-11:30 a.m. at the school facility, located at 800 Rahway Ave., Westfield, in the Thomas Alva Edison Intermediate School. Parents and students are welcome to explore our school and experience Chinese culture and language. The dedicated faculty and staff will be happy to discuss the language curriculum in detail and describe the various cultural classes. Registration for Fall 2015-2016 starts this weekend, on 5/2, 5/9 & 5/16. TASA Nightmarket, which was scheduled for today, has been RESCHEDULED to Sunday April 12th at 6:00PM! We hope that the members of your organization who were planning to come today will be able to join us on a 70 degrees and sunny Sunday instead. Sorry for the inconvenience, and hope to see you there! Hello! We are the Taiwanese-American Student Association from Rutgers University (RU TASA). As a student-run, on-campus association that spread awareness of Taiwanese culture at Rutgers, we have a big event called Night Market that emulates the popular night markets on the streets of Taiwan. This year, our theme draws inspiration from the Hayao Miyazaki film, Spirited Away. We also have performances throughout the night, fun games, and authentic Taiwanese deliciousness served fresh by local eateries. Night Market is going to be on April 10th at 6:00 p.m. on Murrell St., New Brunswick, NJ 08901 between the College Avenue Gym and the Rutgers Student Center. Everyone is welcome, so it would mean very much to us if the members of Union Chinese School could attend our event and spread the word about it. If you are interested or have any additional questions, please reply to this email and we will give you more details. If this is the wrong email, would you mind directing us to a person we can contact with about this information? After enter your email, please go to your email and confirm the subscription. Contact UnionChineseSchool at gmail if you need to modify UCS calendar or as a blog contributor. 請勿將廣告放在comments中 Do not use comments to put any advertisements. It will be reported to spam@ftc.gov.